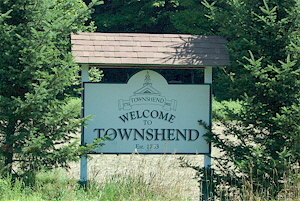 Townshend is located in what is referred to as The West River Valley. The Town is about 17 miles north west of Brattleboro if you are traveling along Vermont Route 30, the main highway through town. Newfane is to the south, Wardsboro and Jamaica to the west, Athens and Brookline to the east, Grafton and a tiny piece of Windham to the north. Truth be told, many people know of Jamaica and Newfane, the other Towns along Route 30, but never realize they had to pass through Townshend, in between them, to go north. It is suspected that the sharp, almost 90 degree shift on Route 30 by the Town Common keeps eyes focused on the road and not on the scenery. (SOUTH ON RT 30) YOU CAN’T MISS IT IF YOU ARE PAYING ATTENTION. FIRST REAL TOWN COMMON ON RT 30 NORTH OF BRATTLEBORO. WINDHAM COUNTY COURT HOUSE ON YOUR LEFT, HEADING NORTH. (NORTHWEST ON ROUTE 30) WELL, NORTH ON RT 30 BUT REALLY NORTHWEST. YOU CAN’T MISS THIS ONE EITHER. YOU CAN BUZZ RIGHT ON THROUGH TO GO SKIING AT STRATTON MOUNTAIN. (NORTH ON RT 35) GO STRAIGHT ON TO RT 35 AT THAT 90 DEGREE TURN ON RT 30 IN TOWNSHEND, TAKE A LEFT ON GRAFTON/TOWNSHEND RD BY THE SOLAR FIELD ON YOUR LEFT. THINK “CHEESE”. (RT 30 NORTH TO RT 100) GO NORTH ON RT 30 AND TAKE A LEFT ON RT 100 AFTER THE BURNED OUT GAS STATION AND THE VT AOT LOT (BOTH ON THE RIGHT). YOU ARE ALREADY IN JAMAICA BY NOW. UNOFFICIALLY OFFICIAL LIKE THIS ONE. (YOU CAN’T GET THERE FROM HERE) WELL, YES YOU CAN. PREPARE TO GET HOPELESSLY LOST AND TAKE SUPPLIES. NOTHING RESEMBLING AN OFFICIAL WEBSITE. IF YOU KNEW ATHENS, YOU WOULD UNDERSTAND. (WINDHAM HILL RD OFF RT 30) TAKE A RIGHT OFF RT 30 IN WEST TOWNSHEND ACROSS FROM THE CAFE AND GO UP THE HILL. BETTER UP THE HILL THAN DOWN. DON’T BLINK OR YOU WILL MISS IT. (ELLEN WARE RD, OR PLUMB RD, GOOD LUCK WITH EITHER.) TAKE A RIGHT ON TO EITHER RD OFF RT 30 IN HARMONYVILLE. ELLEN WARE, FIRST RIGHT AFTER WEST RIVER BRIDGE. PLUMB RD, YOU WILL MISS IT SO CONTINUE TO TOWNSHEND CENTER.